Past Missions — International Breast and Medical Missions, Inc.
And here's just a small sampling of missions we have completed over the years. We treated almost 200 patients and performed 65 surgeries at the Wachat hospital, a rural hospital in Sagaing, and at the Mandalay General Hospital. Our team members included, Dr. Alison Estabrook, Chief of Breast Surgery at St Luke’s Roosevelt Hospital, Dr. Raymond Wedderburn, Chief of Trauma Surgery, Mark Shikowitz, the vice president of the ENT department and 13 other well established and prominent physicians, nurses and residents. All of the people in the group participated in this mission out of the kindness of their hearts and without compensation. They took time out of their busy schedules, used up their vacation time and expenses out of their pocket to help people of Myanmar. We worked with Burmese surgeons in performing more complicated surgeries including laparoscopic surgeries, gave lectures and taught ultrasound guided biopsies. We provided the general hospital with a fundamental laparoscopic skills training sets which was greatly welcomed by the younger staff. Minimally invasive procedures like laparoscopy can decrease infection rate and offer faster recovery time which are invaluable in this population. We instructed the physicians on breast biopsy techniques, so that patients can avoid unnecessary breast surgeries for benign diseases, thus freeing up resources for others. We provided end stage patients with cost effective medication that can increase their survival. We treated over 100 patients with breast diseases and performed biopsies and surgeries for patients with advanced breast cancers. Medications for breast cancer were provided to the patients. We treated general surgery, breast and ENT cases in Mandalay General Hospital and the ENT hospital in Mandalay. Ultrasound workshop and training was performed at the East Yangon Hospital. Dr. Ma was a guest speaker at the Annual Surgeons Conference in Yangon, Myanmar. Performed a total of 28 procedures including many breast, hernias, colon, gallbladder, thyroid and sinus surgeries. Perhaps the most important part of this mission was all the teaching that we did as a part of this trip. An ENT sinus workshop was conducted by Drs. Mark Shikowtiz and Wayne Hsueh which had both classroom and cadaveric, hands-on components. In addition, we conducted the use of ultrasound in medicine focus on regional blocks using an ultrasound and FAST exam which was organized by Dr. Aung Myo and taught by Drs. Jinu Kim, Lucy Ruangvoravat, and Hnin Htun. It was attended by almost all medical providers at the Taung Gyi hospital. We worked together with local physicians during our cases on laparoscopic, breast and thyroid procedures. Collaborated with Corrine Beaumont from the Worldwide Breast Cancer to translate breast cancer detection poster which were distributed at various hospitals in Myanmar. We were thrilled to see that Mandalay hospital has started to do needle biopsies using the biposy guns and needles donated by the AmeriCares which means that patients are going to surgeries with a diagnosis and avoiding unnecessary surgery to do a biopsy. Several patients flew came from 300 miles away when they heard that we were seeing patients at the Mandalay hospital. Even on our last day, we still had about five more breast patients who needed surgeries. 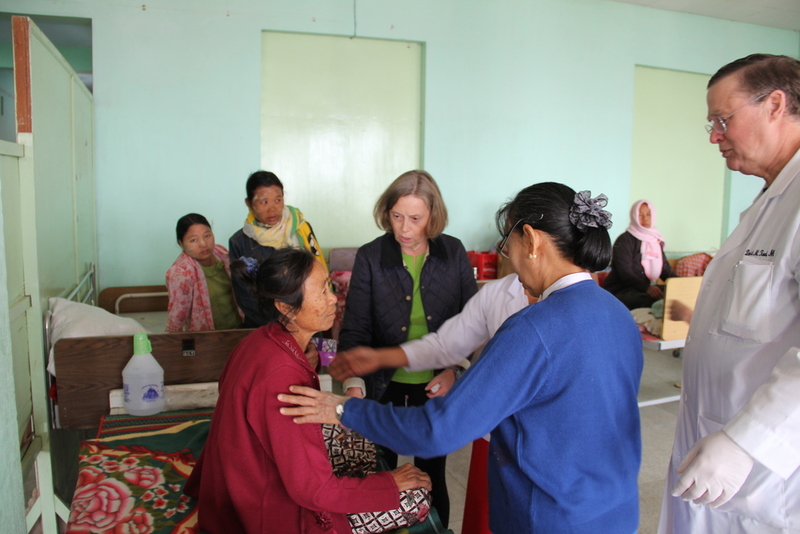 However, after working closely with the physicians there in Mandalay, I'm confident and reassured that the patients will receive excellent surgical treatment even without us. For almost all the cases that we performed during this trip, we were able to treat patients efficiently and successfully because some of the supplies donated by AmieriCares, MAP international, supplies bought by funds donated from our generous sponsors and brought by our volunteers. We also donated a new Terason ultrasound machine with the help of Dr. Alison Estabrook to the Mandalay General Hospital. Breast cancer medications were donated with the help Dr. Tu Tu Aung. It helped that we were able to use good quality equipment and supplies during our mission which we were already familiar with. I felt that among our trips, this was probably the most successful because we did the most teaching during this trip which can benefit most people in the country. Our mission was successful because of cooperating from our partner physicians at Myanmar who helped select several patients for us. We are grateful to work closely with Dr. Tin Kyu at the Taung Gyi hospital, and once again with Dr. Htay Oo and his team at the Mandalay hospital. Very big thank yous to our participants who volunteered their time, collected supplies, shared their knowledge and experience and worked with many local physicians to make this mission a success. They are Drs. Deva Boone, Jenny Cai, Wayne Hsueh, Hnin Htun, Jinu Kim, Daniel Rogel, Lucy Ruangvoravat, Mark Shikowitz, and Raymond Wedderburn. We have to thank our support team Ms. Sophie Stone for helping with trip arrangement, and Mr. Daniel Bevan for taking all the memorable pictures. In addition, we appreciate everyone who donated towards the mission and was part of the fund-raiser.